I’m thinking…Cookies, iced cookies and especially French inspired cookies which I find to be some of the the very best kinds of cookies on the planet. Welcome to the start of my latest project..joining in with the online baking group Tuesdays with Dorie. 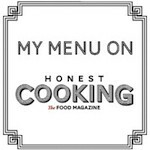 We will be baking through the entire brand spanking new Baking Chez Moi..the latest and greatest cook book from one of my favorite bakers..insert bright red hearts…Dorie Greenspan. This first recipe for palets de dames, Lille style is a simple and good one that makes enough cookies to share with your friends. Even without a copy of Baking Chez Moi, which I would consider picking up as you will love it…you can bake along too, please look below for the link to the downloadable recipe on Amazon. So cool, it’s great to be back, although I had a boat load of spam to remove from my blog before I could get started creating a new post for Tuesdays with Dorie. Does it feel weird to post on my blog after taking a long break, about a five month self imposed time out? Yes it does. Am I coming back all refreshed and ready to tackle an exciting baking project with a wonderful group of baking Doristas..yes siree, Bob.. I think I’m up to the challenge! Palets de Dames, Lille Style is great choice for the first Baking Chez Moi recipe for the Tuesdays with Dorie group and this recipe is happily available on Amazon..as one of a few sample recipes from the book. Please click on the previous link to find the recipe for Palets de Dames, Lille Style from Baking Chez Moi. I was looking for a fun project to inspire me to get back into posting on my blog and I think that baking along with the Tuesdays with Dorie group is the perfect jumping off point for me to get going again. The groupie in me was alive and well two weeks ago as I followed Dorie’s Baking Chez Moi book tour to Sur La Table in San Francisco where she baked her version of Canistrelli, traditional cookies from Corsica made with olive oil, white wine and Pastis. I met up with another Dorista, Alice Mizer who I met at our first ‘official’ get together at the IFBC conference in Seattle. We took photos, caught up on Dorista news, nibbled on cookies (homemade by Dorie! ), we also had a chance to visit with Dorie and came away with autographed copies of Baking Chez Moi. 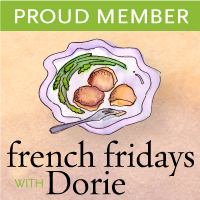 I remembered how much I enjoyed preparing the weekly recipes from Around My French Table with the French Fridays with Dorie group and I’m expecting that Baking through Baking Chez Moi will be just as rewarding. A few words on baking Palets de Dames, Lille Style ..first off, like many of the cookie recipes you will find in Baking Chez Moi they are simple and homey. I loved the soft springy dough as well as the confectioner’s sugar icing dipped tops of theses cookies that dry quickly forming such a pretty white coating. A slight shimmer can be added with a sprinkling of coarse sparkling sugar. Dorie recommends serving your palets de dames with a cup of coffee but I liked serving these delightful cookies alongside a cup of tea. Yes, the La vie est belle. Oh Yay!! So glad you will be baking along with us, Patty!! Your cookies look fabulous as do your photos! I really enjoyed these…perfect with my cup of tea! I am so looking forward to baking through this book, and so happy that so many friends are joining in on the fun!! Happy baking! So glad that you’ll be baking along with us! Your cookies are lovely! Your photos are gorgeous, your cookies look perfect, and I am thrilled to have you in the group! Thanks Laurie! Really looking forward to baking with everyone! LOVE LOVE LOVE that you are participating Patty !!! You always have such spectacular results and I really enjoyed meeting up with you in Seattle. Good times indeed. My fingers are crossed I can keep up – esp while we do both AMFT till the end along with this. As I have said before, if energy wanes I can now pull out a batch of these little guys and just put on another pot of coffee And loved those photos of you and Alice at the cookbook signing. Fab. So happy to hear this!!!! I’m going to grab a copy of her new book myself. I’ve missed your tasty treats. Breaks are a good thing and I for one planning on taking as many as I need. I want one of these cookies so bad right about now. Looking forward to seeing you soon. look delicious, we loved this recipe. Hi Patty, so happy to see you are baking with TWD. Your cookies are very pretty – and weren’t these delish! So happy that you are back in action! I missed you. Headed to see Dorie on Saturday – can’t wait! Yay Patty! I’m so happy to see you I don’t mind (too much) that the 49ers won this weekend. Loved seeing your pictures of the weekend in New Orleans. I am SO glad Dorie brought you back! I’ve missed you. Thought of you when my gang was rooting against the 49er’s on Sunday…but I secretly cheer for them b/c of you! Your cookies look delicious and beautiful! I am so glad we are both back to baking with TWD! Beautiful photos and cookies! I’m new to the group and am very excited about baking through this lovely book with everyone. So glad you’re back, and with the promise of more Dorie and more baking! I agree with you – tea would be just right with a plateful of these beautiful cookies! It’s so good to see you back! Your photos are so gorgeous and your cookies turned out perfectly! It’s nice that you could meet up with Alice and Dorie! I finally got to meet Dorie when she was in Vancouver – she’s lovely. Hi Patty..GOOD to see you back with such a lovely sweet treat! Those photos are so dreamy and beautiful. Hi Patty! So happy to see your post in my in-box! Especially when you entice us with these fabulous cookies. I must purchase Dori’s latest…and soon! Beautiful! I am so glad we started out with such a simple, yet delicious recipe. Hi Patty and welcome back! Your Palets de Dames turned out picture-perfect. I purchased Dorie’s Chez Moi too, with every intention of joining the new baking group for this book (even got my cute tea towel from the publisher), but have already missed the first entry! Aaaagh! Hopefully, I can get my act together and bake along too! Happy to see you back in action Patty! You’ve been missed! Envious that you got to see Dorie and Alice too! Your cookies look delicious. Your cookies look lovely and beautifully photographed on your china!! So jealous that you got to see Dorie on her book tour! Stunning photos as usual! I for one have missed your posts. Looking forward to baking along with you. What beautiful plates to display such beautiful cookies. Outstanding photos, I just love flowered plates! So great to see another post from you, Patty! These looks so delicious and the description of them sounds wonderful. Thanks for the link! Welcome back, Patty! You aren’t the only one who has taken a hiatus from blogging I, too, have take some time off and hope to get back into it very soon. These cookies are absolutely beautiful. Great photos! Welcome back Patty. I too have missed you recipes and great photography. Looking forward to following you again. Great photography! The Palets look delicious. I am making these too and they’re delish. However they spread out and have an irregular shape, even though I used a cookie scoop!